haaha .. nice one ! 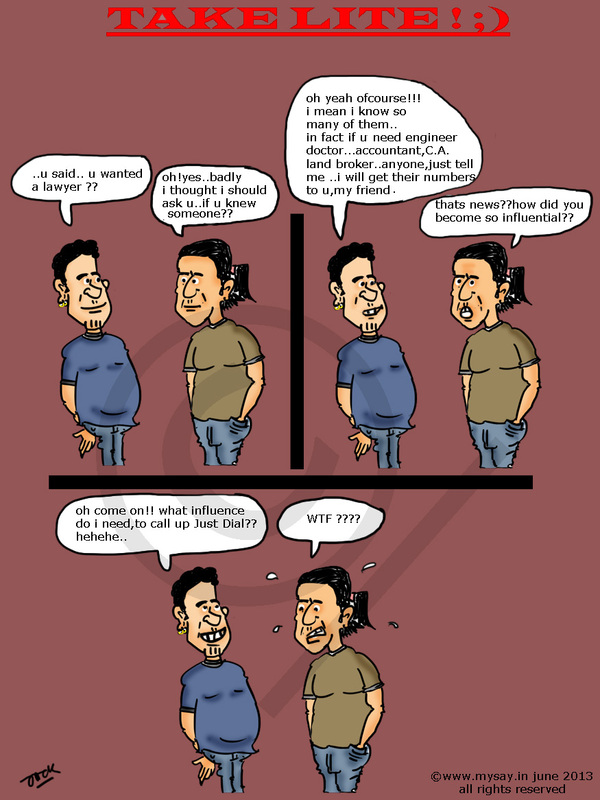 btw its good to know about your new venture into comic strips …wish you success !! Haha 😀 . Now the entire country who has the Just Dial phone number and a mobile phone can be called influential. its true Bush.. political cartoons are best liked when we are updated about politics and wish to be … waise I have no specific interest anymore in politics .. sab ghuma phira ke ek hi hai .The comic strip which talk about day to day life… which is about u me and all of us is lot better and trust me till DJ my friend is there and other friends too.. i think I will never be short of making you and other esteemed visitors smile if not laugh. He is a walking doodle … so am I but he is a bigger one 😀 He visits the site occasionally and laughs on doodles at him … 😀 .. soon will come a character Suku Paaji .. he is another gem of a doodle in real life and bound to make readers giggle ..
Keep going and best wishes for this endeavour. I look forward to your doodles whether politics or otherwise, though of late stalemate prevails in politics of our times. Keep us happy with the smiles that you spread! !